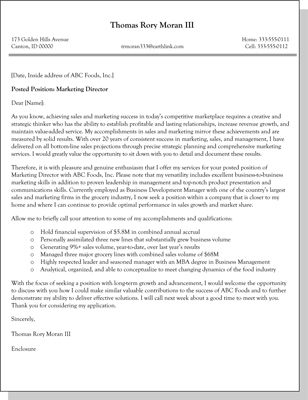 A marketing director (Moran) who wants to change jobs uses a one-page resume letter. He begins with a way-of-the-world statement that works because he prefaces it with As you know. Otherwise such statements risk being perceived as overbearing. The rationale given for changing jobs — working closer to his home — seems reasonable in a time of record-high transportation costs. 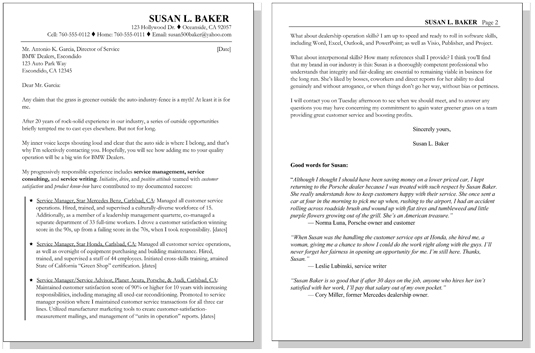 Responding to a job ad with a one-page resume letter is an option to mute age issues before an interview. A mom (Baker) wants to re-enter the auto industry job market after a two-year absence because of illness and a wish to consider other career fields. She begins with an informal hook approach that disarms the reader. Adding to that overlay of charm, the job seeker adds a summary of impressive experience, capping her letter with three powerful testimonials. Job market reentry issues are good reasons to let the resume letter carry the message. 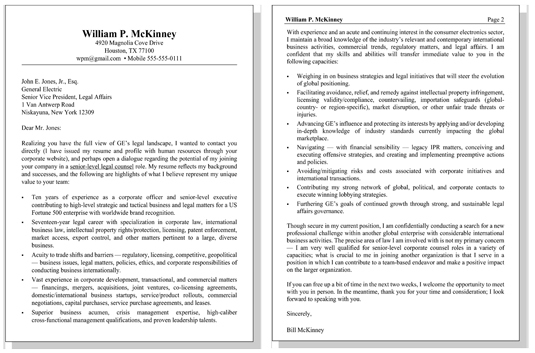 A savvy lawyer (McKinney) seeking to relocate to a senior-level legal counsel position in a multinational corporation writes an elegant letter detailing his value proposition. The candidate uses no gimmicks, just hard-core competence to sell himself. Busy executives can more easily read letters than study resumes. For that reason, supporters of resume letters believe that they are more likely to be read than a cover-letter-and-resume package.